Our Disney vacation ranch villa has 4 bedrooms, 3 bathrooms and is luxuriously furnished and tastefully designed. It has a private screened pool and spa. Our home is conveniently located in the popular and exclusive community of Sandy Ridge near Interstate Highway I-4. It is less than 10 minutes to the main gate of Disney World, 1 mile from Champions Gate Golf Resort, Reunion and shopping center. Five championship golf courses are within easy reach. With only 1 mile from Intestate Highway I-4, it gives quick and easy access to other attractions, beaches and countless restaurants and activities. All the bedrooms are equipped with top quality mattresses and linens for superb night's rests. Quality through out! The living room has a 46 inch high definition cable television with a BluRay/dvd player plus a Wii and Game Cube and CD player. There is free high speed Internet and 50 state, Canada, Puerto Rico, and Guam long distance calls. Puzzles, cards, poker chips, Yahtzee, Scrabble, Monopoly, Trivial Pursuit, and Uno are available for your entertainment. The kitchen is fully equipped with dishwasher, microwave, coffee pot, toaster, blender, slow-cooker and cook and bake ware to make meal preparation simple. A Weber Kettle BBQ grill is just outside as well as a table top gas grill. Acrylic glasses and stemware make outdoor dining and lounging safe for poolside. There are hair dryers in each bathroom, alarm clocks in each bedroom, and a crib, stroller and high chair are available at no extra charge for your convenience. A full sized washer and dryer plus an ironing board and iron are on site. The villa is managed by a professional local management company with a 24/7 emergency telephone number. Our goal is to make you so comfortable in our home that you’ll be back year after year. When we found our home in Sandy Ridge, we knew it was the perfect place to enjoy a Disney vacation and still have the peace and quiet every vacation needs. Having our own pool to relax in makes all the difference. The neighborhood is quiet and secure and we love taking walks or riding the bikes around the area and meeting new friends. Tropical plants around the pool screen attract hummingbirds and butterflies while providing privacy. We have tried to furnish every possible need or want for your vacation. We hope that you'll have a wonderful time and feel at home so you'll want to return year after year. My family of 6 had a wonderful trip to this rental for my daughter's 8th birthday trip to disney. We loved all the games and the nice pool. The owners are helpful and friendly with a very clean home. We will deffently be renting again on our next trip south. We just spent the month of March is this lovely home. It truly is a home away from home. The two master suites are at opposite ends of the house affording great privacy. The kids rooms are all decked out with Disney themes and all the beds in the house are very comfortable. The furniture is also extremely comfortable with three chairs that have pull out foot rests. The kitchen has everything imaginable for cooking your own meals including a crock pot which I used to cook Easter dinner in and a waffle iron which we used to make waffles with fresh strawberries grown in Plant City, Florida. Even the frying pans are new and clean and there are lots of baking dishes, casserole dishes etc. There was a muffin tin but it was the only item that was not in good shape and I would recommend the owners buy a new one. The owner was a dream to work with and the caretaker Wayne was very caring and considerate and helpful. The door has a keyless entry which is so handy to not have to worry about keys. The outside pool is small but the temperature was maintained at 85 degrees which was just perfect for day or evening swimming. The washer and dryer were huge and super easy to use. There were all kinds of games and such to use although we did miss having our scrabble dictionary handy for disputes! The house had all the little things too-like nightlights in the bedrooms and hooks on the back of the doors. We really had everything we needed for a full month of enjoyment. The location is so perfect too being so close to the I-4 that is was handy to anywhere you were going in Florida. We even took a mini cruise to the Bahamas from Port Canaveral which was just a one hour and fifteen minute drive to get to. I would totally recommend this house to anyone visiting in the Orlando area! My family and I had a wonderful time at this house. It was as if we never left home. The little details around the house made it extremely comfortable to stay in. And with all the games and the pool, my children were never bored. (And that's saying alot.) The house is gorgeous and the garden outside was lovely to see. 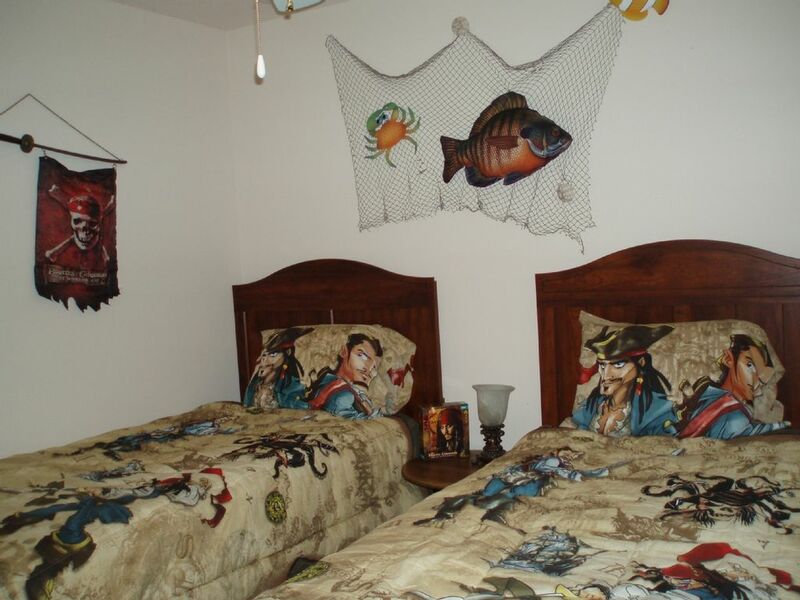 My two daughters were enchanted by the princess room and my son loved his pirate room. Whether it was coming back from a long day in the parks or staying in all day, we couldn't have asked for more. We all loved staying here and will definitely come back! We loved the property and had a great stay! Highly recommended. Clean and well maintained. Great customer service. Princess and pirate rooms were absolutely adorable. Our home is conveniently located near all the major attractions and golf, but also in a quiet subdivision for peaceful unwinding. A fully equipped kitchen and Weber grill make meal preparation simple. Publix grocery store, Target, Best Buy, and many restaurants and shops are within minutes away. We offer complimentary WI-FI and free 50 state, Canada, Puerto Rico, and Guam long distance telephone.